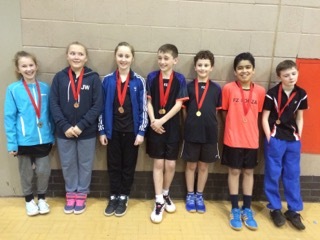 A successful day for Leicestershire players in the under 13yrs bronze in Worcester on Feb 6th . Tom and Danny got their first gold medal of the season in the doubles. Danny and Tamsin got bronze in the singles events. Sophie and Tamsin , Owen and Ayush got bronze in the doubles and Tilly got Silver in the plate event.